On this date in our extended family history . . . the 8th day of November . . . in the year 1867 . . . Samuel Houston Sharp, Jr. is born in Liberty County, Texas . . . this Sam is an older brother of Berta Mary Henry nee Sharp (1873-1955) . . . who is a maternal great-grandma to the Keeper of this family history blog . . .
Sam had just turned 7 when his 3rd little sister, Berta Mary, was born in 1873 on the Hall Plantation in Houston County, Texas . . . less than three years later their mother died . . . and then ca. 1885, their father as well as their paternal grandma followed their mother in death . . . In January of 1889, Sam married Emma Henry in Milam County, Texas . . . six years later, in January of 1895, Sam's little sister, Berta Mary, married Emma's twin brother, Edgar, in Houston County, Texas . 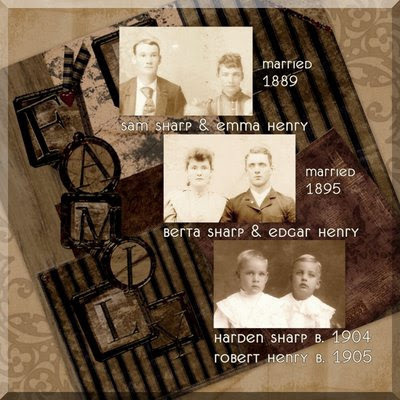 . .
Each couple had multiple children before William Harden Sharp was born to Sam & Emma in September of 1904 . . . and then Robert E. Henry (my maternal grandpa) was born to Edgar & Berta Mary in February of 1905 . . . This means that the two little boys in the above collage were double 1st cousins . . . but were the same, genetically speaking, as being half-brothers . . . double first cousins share both sets of grandparents, but have different parents . . .
Labels: 20th Century, Henry, Houston Co., Maternal Ancestors, Maternal Kinfolk, Milam Co., Month of November, Sharp, Williamson Co. I love your photos and graphics...I think that it makes the family story come alive!